Dr. Preeda Pungpapong is a Clinical Assistant Professor in the Department of Prosthodontics at UNC School of Dentistry. He completed his DDS training and received his certificate in Prosthodontics at School of Dentistry, Chulalongkorn University in 1999 and 2002, respectively. 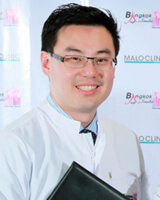 In 2005, he received his certificate in Prosthodontics and M.S. degree in Oral Science from the University of North Carolina at Chapel Hill. He also received certificate in implant fellowship from Department of Periodontology, University of North Carolina at Chapel Hill in 2006. Dr. Pungpapong has been honored as a Diplomate of American Board of Prosthodontics in December 2008. His teaching responsibilities at UNC include pre-doctoral and clinical Fixed, Removable, Implant prosthodontics, Graduate Prosthodontics. Dr. Pungpapong is actively involved in patient treatment in UNC Dental faculty practice include the diagnosis and treatment of patients with severe attrition. He is actively involved in the dental implant surgery and restoration of patients requiring implant-supported prostheses as well as fixed and removable prostheses.